***FREE ESTIMATE OFFER*** - We will provide a Free Estimate for any job including a BBQ Grill Repair /Full BBQ Restoration/ NEW BBQ Grill/ BBQ Island Build. Free Estimate Offer is valid with a fully Completed Service Request Form. A picture of the BBQ GRILL must be submitted including a description of your service need (ie: BBQ, not lighting, Burners not heating properly, Opinion/Quote to restore old BBQ versus Installing a New Grill). We will come to your home and provide a Diagnostic Check of your Gas BBQ Grill / Other related components of the BBQ Island for a nominal cost of $49.99 within the areas of Orange County and San Diego. The cost of the Diagnostic Check / Estimate is applied toward any work you choose to do with us (if you choose us to perform the work within 30 days of the estimate). A complete estimate / price quote will be provided to you upon the conclusion of our diagnostic check-up. The price quote/estimate is based upon our findings as well as a discussion with you about what you would like to have done / results you are looking to achieve - ie: Deep Cleaning, BBQ Grill Repair, Grill Replacement Parts, New BBQ Grill Installation etc. The technicians at BBQ REPAIR PROS are professionals who have many years of expertise in Gas BBQ Grill Repair, BBQ Manufacturing, BBQ Installation, BBQ Cleaning, Fire-Pit, Outdoor Heating business. Our comprehensive Diagnostic Check-up will enable you to make an informed decision based upon our recommendations. BBQ REPAIR PROS has built a reputation of fair dealing and outstanding reviews by enabling our customers to be able to make intelligent decisions on the project. BBQ Repair Pros is the right choice to handle your Gas BBQ Grill / Outdoor Kitchen as we are true experts who can give you a legitimate estimate of the needed work to be done. We do not try to “sell” you on unnecessary BBQ repairs or other BBQ Cleaning Services. After we perform the Diagnostic Check-up, we will provide you with a “BBQ Condition Report” that includes information on the overall performance of your expensive BBQ grill, the various internal parts of the BBQ Grill and information to enable you to discuss the options you may want to consider. The Condition Report included with the Estimate gives you the information you need on how to keep the appliance at top operational efficiency. Once you decide on what work you would like to have done, we are confident that selecting BBQ REPAIR PROS to perform the work is the right decision to get your BBQ grill back into top operating condition. Minor adjustments (such as igniter repositioning, wiring/connector repair, valve lubrication, flame height adjustments by the valve set-screw and BBQ burner air shutters) may be performed during the barbecue Tune-up Service Call. The cost of major BBQ replacement parts such as burners, valves, regulators, heat shields etc. are not included in the price of the Barbecue Service Tune-Up/ Service Call price. The Tune-Up BBQ Service Call may include a basic vacuum-out of ash/accumulated debris in the interior of the grill, but does not include a deep cleaning. This service would enable the technician to provide the customer with an overall evaluation of the BBQ Grill's performance and make recommendations of any BBQ Repairs that may be necessary. A written estimate of what type of additional service/cleaning or repairs may be provided to the customer. The Premium Deep Cleaning Service includes removal of major parts of the grill, cleaning and inspecting each part, removal of grease deposits on the inside and outside of the grill. The various internal parts located deep inside the BBQ grill are removed, scrubbed and washed in an effort to remove much of the built-up grease and grime that impedes the performance of the BBQ burners, valves and vital components of the barbecue grill. The barbecue igniters are checked and adjusted. The interior of the BBQ grill is thoroughly cleaned including burners, cooking grates, heat shields. The grease drip pan is removed and washed. The BBQ valves are cleaned and lubricated and the exterior of the BBQ grill is cleaned and polished. • Customer had a professional BBQ cleaning in past year by BBQ REPAIR PROS or ANY other professional service (with a receipt demonstrating the service performed). • BBQ REPAIR PROS Website “Book Appointment Form” filled out and a picture of Grill Attached. • A Neighbor Referral on same Street of customer and work scheduled for same day. 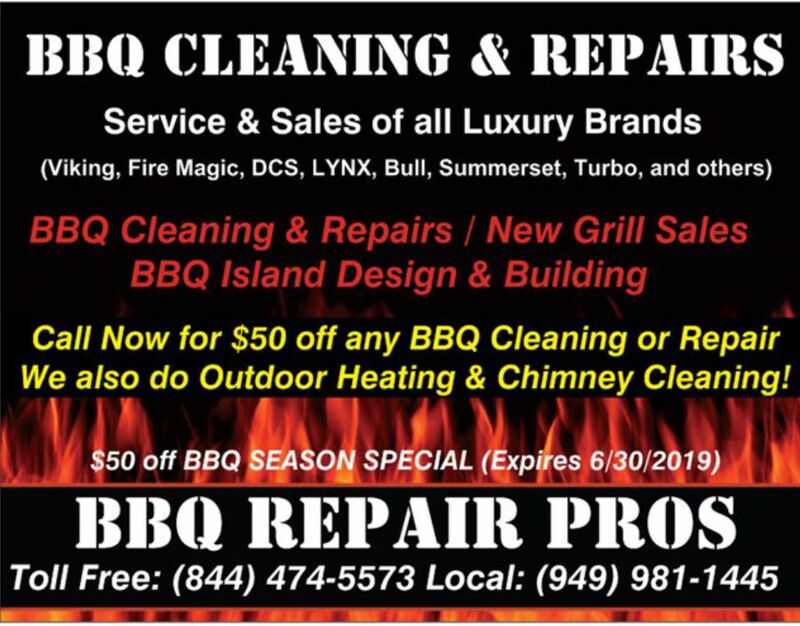 • BBQ REPAIR PROS Coupon or Postcard. *PLEASE NOTE: EXTRA LARGE EXTREMELY DIRTY GRILLS: Grills above 30" or grills that are exceptionally dirty may require $50 additional charge. Installation of new replacement parts to repair the grill are an additional cost to any cleaning service. The ultimate in BBQ Maintenance is our Quarterly BBQ Maintenance Program! This service ensures your grill to look beautiful and operate correctly each and every time you use your grill. What’s more is our technicians will be “On-Call” for you when you need immediate service for any operational difficulty. This is the ultimate in Premium BBQ Cleaning / BBQ Service at a substantially discounted price. It includes a “deep” grill cleaning and functionality test at each visit. This premium service ensures the longevity of your grill and provides automatic routine BBQ Cleaning and Maintenance for the busy Orange County Family – with minimal/no fuss and worry about the BBQ grill. A BBQ cleaning is combined with a tune-up of the various vital operational components of the appliance is included in the quarterly maintenance program and includes removing the various internal parts located deep inside the BBQ grill, inspecting those parts, cleaning and adjusting them to maintain and perhaps improve the performance of the BBQ grill. This is the pinnacle of BBQ Cleaning & Repair Service. Once we have an opportunity to bring the grill up to “manufacturer standard”, we can implement this program to keep the appliance in tip-top condition. The barbecue igniters are checked and adjusted to ensure the grill lights each and every time the grill is used. The BBQ cooking grates and heat shields are cleaned and brushed. The grease drip pan is removed and washed. The BBQ valves are cleaned, lubricated, tested and adjusted as necessary as valves need to be maintained properly to ensure the optimum performance of the grill over time. The interior of the BBQ grill is cleaned and the exterior of the BBQ grill is cleaned and polished. The Premium Quarterly Barbecue Cleaning service is intended for people who demand perfection and want their BBQ Grill in great condition whenever they want to cook! No more worry about when to call the “BBQ Service” - as we will automatically come to take care of the grill on a routine basis! You will be alerted when parts need replacement, and we will replace them only upon your approval. *BBQ Quarterly pricing is variable depending on usage and size of the grill. On-Call Service includes response to a request for service within 48 hours. Do you have a Fire-Pit that isn't flaming the way it used to? Your Fire-Pit may need to be cleaned out and a new Fire-Ring Installed. We remove the Lava Rocks in the fire-pit, remove any garbage/accumulated debris from the inside of the Fire-Pit, inspect the interior cement for cracks, check the fire-pit gas valve and gas piping/connections and for potential gas leaks. Loose gas valve or piping connections are tightened and we provide you with a new fire-ring - INCLUDED IN OUR FIRE-PIT SERVICE! • A new Fire-Ring is INSTALLED and included in price (up to 24" standard black pipe). • Additional piping, valves and other repairs may be done as needed to achieve the best fit and finish. • New sand, lava rock or fire-glass may be installed as well upon customer request. Installation of new lava rock/fire-glass and other repairs needed are additional to the cost of the clean-out price. Grills above 30" or grills that are exceptionally dirty may require $50 additional charge. Installation of new replacement parts to repair the grill are an additional cost to any cleaning service. We provide a new 1/2" black pipe fire-ring up to 24" in diameter. Larger sizes require an additional charge. Run by proud patriots of America!